This community of SFR writers, readers and fans has a happy history of not requiring a number of rules in regards to posting to the blog, other than to leave at least 3-4 hours since the last post so each has a little time at the top of the page. Due to a number of complaints by members, I think it's time we consider a new rule for posting to the SFR Brigade blog regarding "drive-by" self-promotional links. This is the posting of links to sales pages, "buy-my-book" advertisements, promotional blogs or fanpages without any further discussion, interaction, communication, or contribution to the community. This does not apply to articles related to book promotions, blog tours, or book discussions with sales links or any other post that provides content in addition to a promotional link, or members who regularly contribute to and interact with the community. In other words, the rule would apply to members who post solely for self-promotion purposes without any other interaction with the community. A poll has been posted above so community members can vote their preference. Comments and discussion are also encouraged about the purpose of or need for the new rule, but we ask that the comments be kept general and individuals or specific examples not be singled out. This voting poll will run for one week or until 30 votes are received, whichever comes first. I voted "do not agree" because I think that just-released books should be allowed at least one promo post if it's a legitimate announcement of a new work. How would this be enforced? How about requiring the publication date of the book along with the other info. For folks that have older works never seen on SFRB, just keep writing until you have a new book to announce going forward. To be a good SFRB citizen, a poster of a new promo should also post one informative post that's not a promo. No way to enforce this. Just know that others will notice. I think what members are having an issue with is when another member posts ONLY self-promotion links, and otherwise never interacts with the community, comments, contributes, or posts any other content to the blog. Promotions by active members are always welcome. Am I understanding this right? I did voted to agree. But aren't we also here to support each other and our releases? On the other hand those who are never around until they have a release and all they do is add a link to the buy page, well that's not good either. It's hard to judge, although I did vote for the rule. I'm still not convinced that we should revoke a member's ability to post completely. Maybe the rule could be modified. Modifying rules are always a good thing. We don't want to lose members, we want to gain followers. I'm not one of those who has a problem with promo posts from members who aren't active. Still I get your point and I do understand. I believe more discussion as to how to enforce the new changes and what exactly those changes are would be good. Those who have a problem with this should come forward and voice their opinion. Hi Kaye. Yes, I agree. That's the purpose of this voting/discussion. I think (at least I'm interpreting the comments received) that these drive-by posts are not being viewed as "supporting each other" which is the purpose of the community, they are seen as "I'm only here to sell my books." I think there might still be confusion that this rule would not apply to active members who also contribute through comments, posts and discussion. It would only apply to a member who exclusively post self-promotion ads and otherwise do not interact with the community. The "hit and run" posts are seen as an annoyance for some of our members (who may not want to express this publicly--understandable), but moderators are being asked to take action when no rule exists against these types of posts. Since this is a community, the majority needs to decide how to handle such posts. If the majority rules "No, don't add the rule" or "I Don't Care" the rule won't be created and won't be enforced. Modifying the proposed rule is certainly an option and all thoughts and opinions are welcome. I'm for the new rule. I've been busy the last two months, so haven't had a lot of time on my own blog let alone being able to hang out here with you all. The last thing I want to do with what little time I have is hop over only to see a bunch of "buy it" posts. Blog tour schedules, posts on topics/themes that tie to a new release, and really cool tech releases are cool, even cover art reveals are fine with me. Also, reviews and rewards are groovy to learn about. I know release promo is important and something we need to encourage, but maybe as a group. At the beginning of the month we could post all the new releases for Brigaders: new releases, coming up the next month. Pippa Jay is already managing the calendar, so if someone wanted to take on the task of making a release announcement on the blog at the beginning of the month, I think it would be valuable to both authors and readers. Well, since I'm Calendar Coordinator, perhaps it would make the most sense for me to take on doing the monthly announcement too? Do peeps want cover art, blurbs and links up, or should I just do the title and a link to it? Pippa, I don't know how you have time to do everything you do...is there a time market where you can buy more?? I think there should be a monthly deadline where we Brigaders can "submit" our new or coming release information (cover art, blurb, purchase link). If we don't make the deadline, then you can just enter the book information from the calendar. I think promo posts are good.. if there's something to actually promo! A giveaway, a new release, a new cover reveal... something other than a "Hey, BUY MY BOOK!" post. I don't mind reading something new and interesting about someone's book - but when every post becomes a plea to BUY MY BOOK it gets boring. @Laurie & Pippa You can always cross post from my monthly release roundup at TGE (I try and get them up on or right around the first of the month). Or cut and paste the new release portion for the Brigade (and add any titles I may have missed). No point in reinventing the wheel, especially when we are all so busy. I track down as many titles as I can but sometimes I miss some (and authors are always welcome to shoot me an email with info). 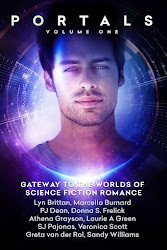 I also update my 2012 new release roundup list (http://www.thegalaxyexpress.net/2012/01/2012-science-fiction-romance-new.html) on a regular basis. All the ideas here sound good. @Laurie I now understand the "drive by" concept better. The idea of listings is good, though too, Heather does that very well. Pippa could still list here or on the calender. And I also think the release parties were such a good idea. Is anyone thinking about those anymore? @Heather - maybe a cross link would be better - as you say, why do it in duplicate if it isn't necessary. I have to say that this month I've added the upcoming releases for the month to my Mission Journal on Spacefreighters Lounge as well. I agree that "Drive-By Self-Promotion Posting Rule" should be enforced by revoking blog author privileges. I don't agree. Members should be free to post whatever content they like to the blog without being expected to interact. I'm undecided or don't care. I create a Blogging Rule box for the sidebar and moderators will start enforcing the rules going forward. St. Patrick's Day Blog Hop!